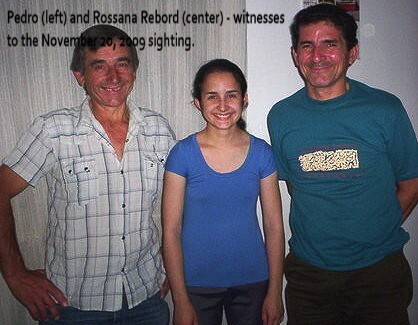 In the early morning hours of Sunday, November 8 (0220 hrs), 2009, the Rebord family returned hme to Barrio Sanatorio. The family, consisitng of Jorge Pedro (Pepe) Rebord, María Isabel (wife) and Laura Rossana (daughter), had toured the area before returning home. As they exited their truck on the street in question, Pep looked skyward over the building (Barrio IAPV, 40 dwellings) and was able to see an object moving in a south-to-north direction. Examining it more closely, he was able to see two additional objects in loose formation. The lights observed by the witnesses were light brown in color and had a slightly bouncing movement, with moderate speed, as the witnesses were able to see them for five (5) minutes approximately. It should be kept in mind that it was a clear, moonless night, which made description easier. The objects were rather high in the air, and the witnesses were unable to express this in meters, and exact measurements are not possible at night. The head of household added that this is the second time that he has seen something unusual in this community of San Jose. The other sighting occured in 2002-03 and in front of his house, but at 0030 hrs. (cannot recall the exact day or date). All local residents saw how the night turned to day, perceiving an object that he believes was a flying saucer. On the following day, the incident was the talk of the town.